The usual geometry taught in school is that of Euclidean geometry – in which angles in a triangle add up 180 degrees. This is based on the idea that the underlying space on which the triangle is drawn is flat. 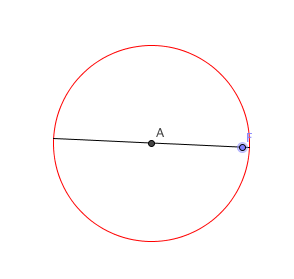 However, if the underlying space in curved then this will no longer be correct. On surfaces of constant curvature triangles will have angles greater than 180 degrees, and on surfaces of constant negative curvature triangles will have angles less than 180 degrees. Hyperbolic geometry is based on a geometry in which the underlying space is negatively curved. 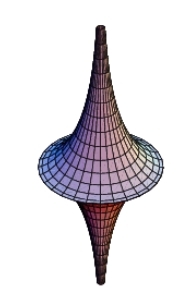 The pseudosphere pictured above is an example of a surface of constant negative curvature. It was given the name pseudosphere as a usual sphere is the opposite – a surface of constant positive curvature. So the question arises, what would the geometry on a surface such as a pseudosphere look like? If we imagine 2 dimensional beings who live on the surfaces of a pseudosphere, what geometry would they believe their reality to be based on? 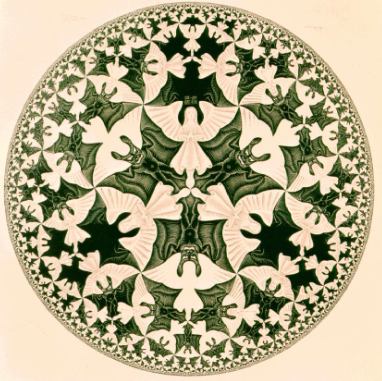 The Poincare disc is one way we can begin to understand what hyperbolic geometry would be like for its inhabitants. The Poincare disc is a map which translates points in the hyperbolic plane to points in the Euclidean disc. For example, we translate points from the spherical Earth onto a flat atlas – and this helps us understand our spherical reality. In the same way, we can arrive at a model of the hyperbolic plane that helps us to understand it, without actually having to picture a pseudosphere everytime we want to do some maths. The Poincare disc maps the entire hyperbolic plane onto a finite disc. 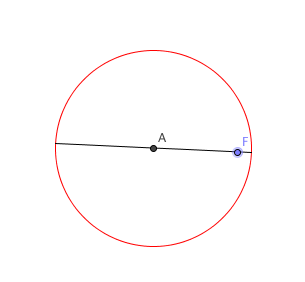 The shortest line between 2 points (which we would call a straight line in Euclidean geometry) is represented in the disc model by both circular arcs and diameters of the circle. 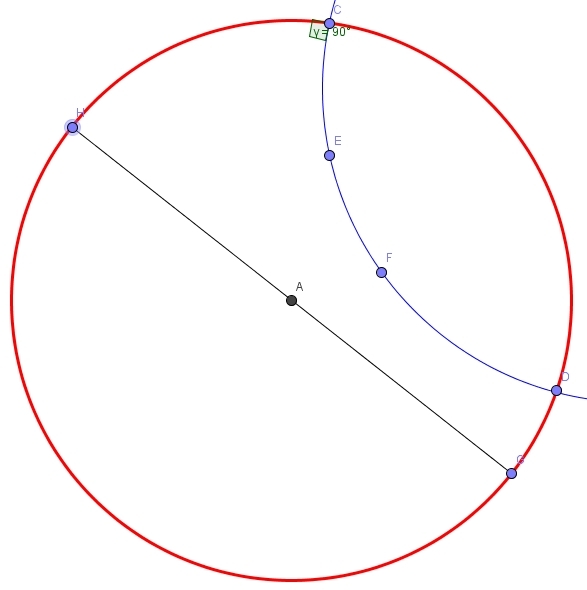 These circular arcs are orthogonal (at 90 degrees) to the boundary circle edge. 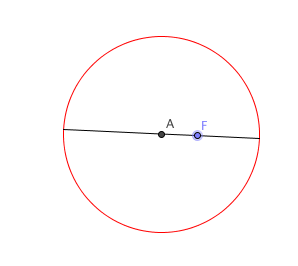 So our model shows that if we wanted to travel between points E and F on a pseudosphere, that the shortest route would be the curved path of the arc shown. Indeed, being able to calculate the shortest distance between 2 points is an integral part of understanding the underlying geometry. 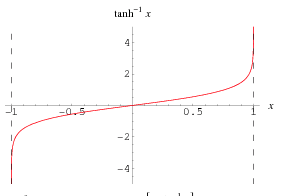 So, if our point F is 0.5 units away from A, then this relates to a hyperbolic distance of 2tanh-10.5 = 1.0986.
y = tanh-1x has 2 vertical asymptotes at x =1 and x = -1, so as we approach these values, the graph tends to infinity. So, remarkably the Poincare disc is able to represent an infinite amount of information within a finite space. This disc model was hugely helpful for mathematicians as they started to investigate hyperbolic geometry. Escher was a Dutch artist who worked in the 20th century. He used mathematical concepts within his pieces. 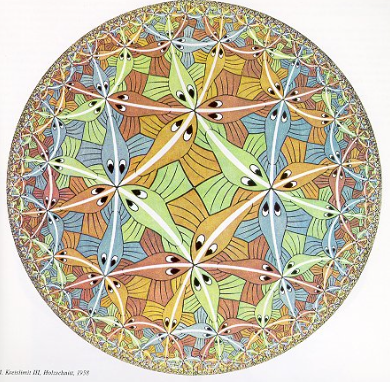 The above piece is one of his most famous, which is art based on the Poincare disc. It consists of tessellations of the same shape – but because distance is not the same as in Euclidean geometry, those fish which are closer to the boundary edge appear smaller. It is a fantastic illustration of the strange nature of hyperbolic geometry and a pictorial representation of infinity. Non Euclidean Geometry V – The Shape of the Universe – a look at how non Euclidean geometry is part of the physics of understanding the universe. Circular Inversion – Reflecting in a Circle – study another transformation which is used in hyperbolic geometry.